We’ve all reached for baking soda from time to time. Whether it’s to leave a box sitting open at the back of your fridge for a few years or adding a bit to a cookie recipe, baking soda has been added to grocery carts plenty of times. However, did you know that there are thousands of baking soda uses outside of just baking? What Is Baking Soda and How Can I Use It? Baking soda is one of the most affordable items at the grocery store, but what is it made of? Baking soda is a compound that is alkaline, and when it is combined with an acid, it will produce carbon dioxide gas, according to The Spruce. The small bubbles from the gas become trapped and cause inflation. There are hundreds, if not thousands of baking soda uses, including cleaning, beauty and health-related benefits. Whether you want whiter teeth, a clean silverware set or to banish heartburn, reach for baking soda. Here are some of the best ways to incorporate baking soda into your day to day routine. Clean the dishwasher. Every once in a while, the dishwasher can start to smell a little funky. Don’t waste money on expensive, chemical-laden cleaners. Instead, sprinkle a layer of baking soda at the bottom of the dishwasher and inside the door. Let it sit overnight, then run the dishwasher without detergent. Wash dishes. Did you know that adding a little bit of baking soda into your dish-washing routine can make them sparkling clean? Load the sink with messy dishes then fill it up with warm water. Add a tablespoon or so of baking soda and let your dishes soak. Clean silver. Make a paste with three parts baking soda to one part water, then use a soft cloth to rub it into silver pieces. Rinse or wipe multiple times with a wet cloth, dry and admire. Make a DIY goo remover. That annoying, sticky residue that seems impossible to remove after peeling off a sticker will have no chance against baking soda! Create a paste with a 3:1 ratio of baking soda to water and rub it on the sticky spot then wipe clean. De-scent the trash can. Trash cans can definitely get stinky pretty regularly. Sprinkle baking soda onto the bottom of the can. Let it sit for 24 hours or so, then wipe up. Get rid of coffee stains. Is your favorite coffee cup looking a little stained? Remove difficult coffee stains with a wet rag dipped in baking soda and scrub stains right off. Neutralize strong odor. Alright, mamas, listen up. One of the best baking soda uses is to sprinkle it over any stinky stains like vomit. Sprinkle baking soda over the area, and let it sit to absorb the smell. Vacuum or wipe it up and say goodbye to the stink! Declog the drains. Remember those volcano science experiments from your childhood? Use that force to unclog your drains! Create a mix of vinegar and baking soda and add hot water to clean out pipes. Clean out your jacuzzi jets. Jets can get moldy, so easily keep them clean by filling the tub a few inches above the jets. Pour in two cups of baking soda, and run the jets for about ten minutes. Drain out the water, add fresh water and run the jets for another ten minutes. De-stink your hands. Been chopping onions or handling garlic lately? Sprinkle some baking soda on the palm of your hand, then rub your hands together with a few drops of water—rinse and dry. Amp up your facial. Skin looking dull? Add a pinch of baking soda to your regular cleaner and your skin will look brighter. Clean your curling iron. A curling iron or straightener ends up picking up wax and residue from your hair products. Remove it from your tool by scrubbing it with a baking soda paste then wipe clean. Amp up your manicure. Scrub your nails and cuticles with a paste made of 3:1 baking soda to water and rub in a circular motion to help exfoliate and clean your nails. Then rinse, dry hands and apply polish. Soften skin. Have dry skin on your elbows or feet? Creating a softening paste is one of the best secret baking soda uses on the market. Mix baking soda with lemon juice and apply on dry skin. Leave on for 10 minutes then rinse thoroughly. Whiten your teeth. Have you ever noticed that baking soda is an ingredient in nearly every whitening toothpaste on the market? That’s because baking soda is an incredible brightening agent. It can be abrasive, so only sprinkle a little at a time on top of your regular toothpaste. Exfoliate skin. Create a mix of three parts baking soda to one part water. Use your fingertips to rub the paste into your skin in a circular motion, then rinse. Clean your hair. Add a sprinkle of baking soda to your shampoo, wash and rinse for extra clean hair, stripped of residue. Stop the sting. If you get a bug sting, use a baking soda paste to help stop the pain and discomfort. Soothe baby’s rash. Any parent knows the misery of watching their child suffer through a bad diaper rash. Draw a bath and add a tablespoon of baking soda and let baby soak. Freshen your mouth. As an odor neutralizer, there are many baking soda uses. One easy way to use it is to mix a pinch of baking soda into a glass of water, then swish, spit and rinse. Remove pesticides. Fruit and vegetables are frequently covered in pesticides, wax and other coatings you don’t want to eat. One of the best baking soda uses is to put a few tablespoons of baking soda in a large bowl of cool water and add your produce. Then rinse thoroughly. Relieve a UTI. Rumor has it that one of the hidden baking soda uses is to help cure a UTI. Mix a half tablespoon of baking soda in an 8-ounce glass of water and chug. Stop heartburn. Put a half tablespoon of baking soda into a cup of water, stir and drink to neutralize stomach acids and cure heartburn. Soothe itchy skin. If you have itchy skin, baking soda may become your best friend! Create a paste with three tablespoons of baking soda mixed with one tablespoon of water and apply to the skin. Rinse after 10 minutes. This works great for irritated skin like sunburns or rashes caused by poison ivy. Are you inspired to pick up a bunch of baking soda the next time you go out to the supermarket? Which one of these baking soda uses are you going to try next?! 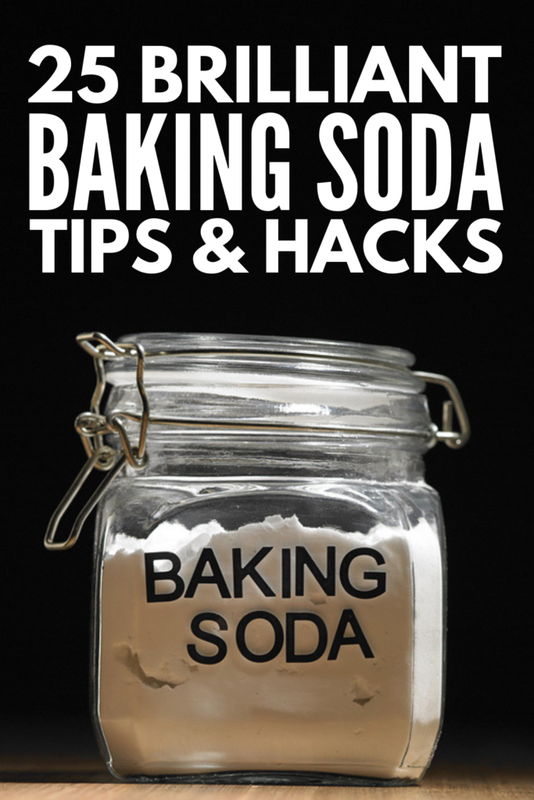 If you found this collection of baking soda uses helpful, please share this post on Pinterest! And if you’re looking for more natural remedies, please follow our home remedies board where we share all kinds of great ideas we find each day!